When it comes to making heart-healthy choices about which fats you eat, there is a lot more to the story than avoiding saturated fat and trans fat. There are certain fats that seem to make your heart healthier and reduce your risk of heart disease. Monounsaturated fats, polyunsaturated fats and omega-3 fatty acids are the fats to make room for in your daily diet. Unlike saturated fats, monounsaturated and polyunsaturated fats are made up of fatty acids that have chemical structure slightly different from saturated fats. Saturated fats are fully saturated with hydrogen, while the unsaturated fats have at least one double bond between carbon molecules. Trans fats are a unique of fat. Trans fats are unsaturated fats, but the shape of the fat is similar to a saturated fat. All foods with fat have both saturated and unsaturated fats. 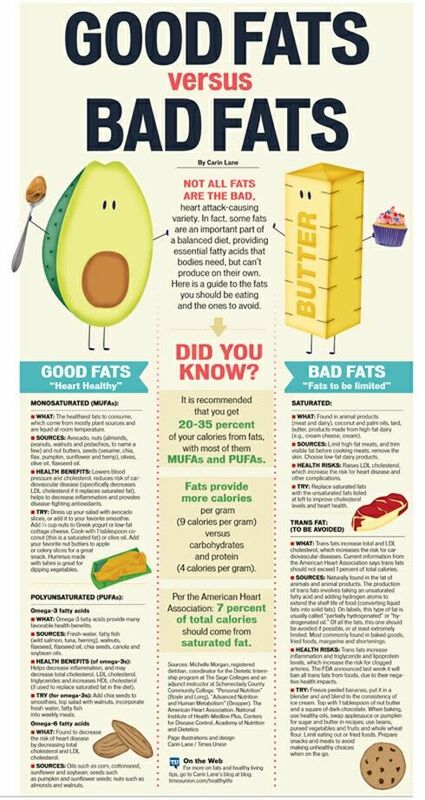 The proportions of the two types of fats vary considerably, though. Foods high in unsaturated fatty acids, however, will be more liquid at room temperature. Think of vegetable oils ant nut oils. For a heart-healthy diet, choose more foods rich in unsaturated fats and fewer foods rich in saturated fat. Omega-3 fatty acids are a special type of polyunsaturated fatty acid. The presence of a specific chemical bond identifies them as omega-3 fatty acids. Eating higher levels of omega-3 fatty acids may lower rates of heart disease. Omega-3 fats may improve cardiovascular health by several means including improving blood circulation and improving levels of blood lipids. Other health benefits may also be linked to omega-3s, such as improved immune function. Omega-3 fatty acids are found in fish and fish oil with the best sources being oily fish like salmon, herring and mackerel. Other sources of omega-3 fats are flax seed oil, meat from grass-feed animals (as opposed to grain-fed animals) and certain nuts including walnuts. Most oils from vegetables, nuts and seeds contain heart healthy fats like monounsaturated, polyunsaturated and omega-3 fatty acids. Plus, they are generally low in saturated fat and contain no trans fat. Some oils are healthier than others, though. One thing to look at is what proportion of the vegetable oil is unsaturated fat. Oils with low levels of saturated fat are olive, safflower, sesame, and sunflower. Although not commonly used as cooking oils, palm oil and coconut oil are plant oils with high levels of saturated fat.